Sleaford Town manager Jamie Shaw believes a cutting edge up front was all that was lacking in his side’s back-to-back home defeats. 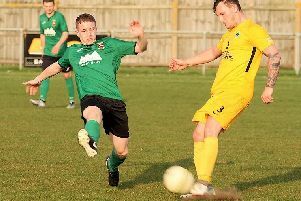 Town were knocked out 1-0 in the United Counties League Knockout Cup on Wednesday, and followed that with a 3-0 loss to Premier Division leaders Daventry on Saturday. But Shaw was frustrated rather than dispirited and believed his side matched two sides who he expects to finish highly this season. “It was a frustrating week for us against teams that will be there or thereabouts come the end of the season,” he said. “We felt in both games that we could, and probably should, have got something on the day, but we’re not quite clicking in the final third, whether that be the final ball, a flick-on not quite going to our lad, or rebounds not falling for us. Town had a man advantage for two-thirds of their midweek cup tie when Holbeach’s Ford was shown a red card for a bad foul on Ward. But they then fell behind before the break and were unable to unlock hard-working and well-organised opponents. Sleaford produced a better performance in a goalless first half against unbeaten Daventry. Joe Smith went close with a header from Ward’s cross, while Daventry’s striker was guilty of a glaring miss five minutes before the break. There were loud shouts for a penalty a minute after the restart when Coupland’s shot was blocked on the line. But Daventry took control with two headed goals from set pieces in the space of five minutes, and six minutes later it was 3-0. The game was over, but Town continued to create chances for the final 25 minutes, with Millard and Tunstall both forcing great saves. “It’s not all doom and gloom, as we are still creating chances and matching good teams,” added Shaw. The fixtures go from one extreme to another on Saturday when they host bottom side Rothwell Corinthians who have picked up just one point this season. But Shaw is refusing to take anything for granted and knows they will need to be sharper.